Recently I had the good fortune to acquire a number of surplus spectrophotometers which use a GRISM as the light dispersing element. GRISM is a transmission diffraction grating laid over the hypotenuse of a right angle prism. The grating diffracts light into a linear spectrum, while the prism serves to correctly angle the grating for straight-through viewing without refracting or further changing the spectrum in any way. Since childhood, among other optical instruments, I had been building slit spectroscopes and spectrographs using prisms and transmission diffraction gratings. And, I had some excellent results. But, all my attempts to construct a simple stellar spectrograph were fruitless. I could get noting better than rudimentary, amateurish results. The discovery of the GRISM opened up for me a whole new universe of astronomy - literally. My first project with the GRISM was to make a "good" stellar spectrograph. It took a few weeks, but the results were very pleasing. The GRISM star spectrograph produces a spectrum which is in line with the telescope's optical axis. In other words, if a star is centered in a telescope eyepiece, the spectrum will be centered in the camera's photographic field. This greatly simplifies and reduces in size the necessary mounting hardware. Other types of transmission and reflection diffraction gratings deviate the light path by a substantial angle, and require complex, heavy, and expensive housings for camera attachment. The GRISM star spectrograph (GSS) can be inserted on-axis into the telescope's light path, with no need for additional collimating or projection optics which is required with virtually all other sophisticated spectrograhs. In fact, using the GRISM star spectrograph is no more complicated than prime focus photography. Unlike prism spectrographs which disperse blue light much more than the red, the GSS produces a linear spectrum in which all colors are equally dispersed. 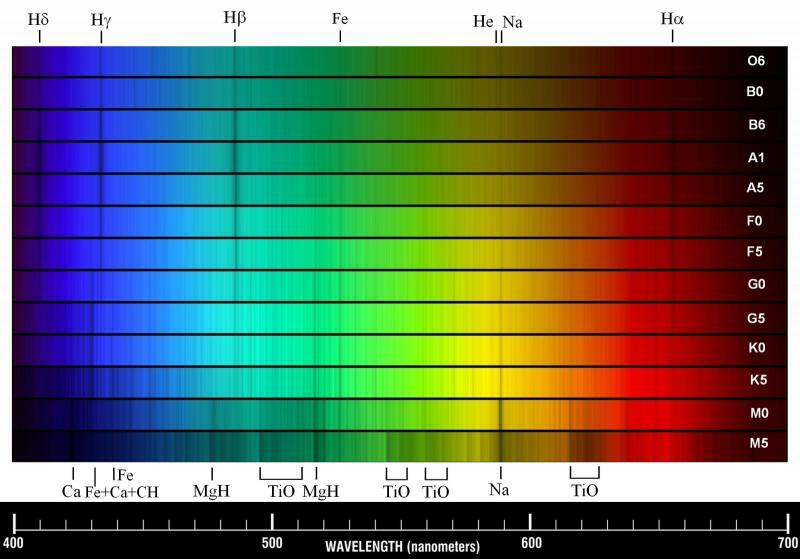 This makes it much easier to later analyze the spectrum, compare it with other spectra, and determine wavelengths of spectral lines. For decades amateurs have been building simple spectroscopes and spectrographs by inserting a low dispersion transmission diffraction grating into the light path of a telescope. There are several fairly expensive commercial products which are also based on this principle. Such products do work but have serious drawbacks. The image of the spectrum is deviated markedly off-center and, therefore, has to be of small size and low resolution if it is to fit into the photographic frame. What is worse, because the spectrum is angled to the focal plane. it can not be precisely focused for all colors at one time. Instructions for the commercial products specify to focus on the spectrum, not on the star image in the center, then to focus on the green color in the middle of the spectrum, which leaves the red and the blue colors defocused. This further reduces image quality and resolution. The fact that the GRISM produces on-axis images completely solves both of these problems. First, the spectrum image can be enlarged to fill the entire photographic frame. Second, the image of the spectrum is parallel to the focal plane, and all colors of the spectrum are in focus at the same time. With a good telescope, under steady atmospheric conditions, and at full camera resolution, the GRISM star spectrograph can produce results which rival low end professional instruments costing ten to twenty times more. Since the image of the spectrum is in focus almost precisely at the prime focus of the telescope, the GSS will function well with all telescopes on which the focusing mounts allow prime focus imaging. This includes pretty much all reputable commercially built telescopes. To a major degree the quality of an image will also depend on the quality of the telescope. Ideal results are obtained with all simple reflectors, catadioptrics, and apochromatic lenses. Conventional achromats have residual chromatic aberration which means that red, green, and blue light can not be brought to a perfect focus at once. The best approach in those cases is to focus on the green color in the middle of the spectrum, leaving red and green minimally defocused. The results will not be perfect, however still much better than with "amateur" spectrographs. The following diagram illustrates the principles of using the GRISM star spectrograph. The GSS disperses "white" light from what would be a pinpoint star image in the focal plane into a thin line spectrum. The line is composed of a series of pinpoint images of the star, each in different color or wavelength of dispersed light. The wavelengths which are missing in the starlight appear on the line spectrum as dark points which are accentuated with yellow markers on the diagram. Later on, the thin line spectrum is vertically resized with image processing software to create a wide band spectrum which clearly shows absorption (and rarely emission) lines. Atmospheric turbulence smears and enlarges the recorded star image, and widens the absorption lines, thereby reducing resolution. The best results are obtained on steady nights, with large telescope apertures, and with shortest possible exposures. Unlike conventional astrophotography in which camera sensitivity above ISO 400 produces "grainy" images, optimum sensitivity for recording spectra is ISO 1600, or even ISO 3200 for very faint stars. Because the GRISM disperses a pinpoint star image into a line almost as wide as the entire photographic field, the line spectrum is very much fainter than the star. With a Celestron 5 excellent spectra can be photographed on stars down to magnitude 5. Fainter stars can still be photographed with good results, but with decreasing quality due to atmospheric turbulence resulting from longer exposures. Remember that for each additional magnitude the exposure, or the surface area of the objective, needs to be increased by 2.5x. Spectrophotography is very refreshing and rewarding to a deep-sky astrophotographer since exposures are very brief, ranging between 1/10 sec and 30 sec. Although exposures of faint objects need to be tracked, they do not have to be guided. Moonlight and light pollution make virtually no difference. And, dozens of interesting spectrographs can easily be acquired in a single session, many more with a GoTo mount. Learning to differentiate between spectral types of stars, and using the Hertzsprung-Russell diagram, it is possible to estimate many physical properties of a star, such as: the surface temperature, size, absolute magnitude, and distance. There are several freeware programs and an excellent commercial product, RSpec, which allow for precise wavelength measurement of spectral lines, and quite accurate spectral classification of unknown spectra. Finally, here are the first light results, all taken on a humid, turbulent Virginia night under moderate light pollution. Images were taken through a Celestron 5, using a modified Canon 600D camera, and tracked with the Celestron CG4 mount. Due to file size limitations, all images are presented at 25% of the original resolution. This is very cool stuff! All you need are a few O-class stars and you'll have a pretty complete set. I've always thought this would be a neat place to go with the hobby. Are you going to try and do quantitative spectroscopy with it? This really is a very interesting field, especially since it allows an amateur to calculate physical properties and distances of stars. The math is quite simple, and I will eventually write a post about it. Such work would be the envy of professional astronomers only a couple of generations ago. The spectrograms I attached are first-light photos taken on a pretty crappy, humid night. Even so, some spectra came out better than others. Compare, for example, spectra of 30 Lyrae and A Aquilae, which are basically the same spectral type. I can't wait to do this again on a cool, clear, steady night, which will probably not happen in Virginia for a couple of months. Also, I need to increase ISO to 1600 or 3200 in order to shorten the exposure, and minimize the effect of atmospheric turbulence. I am not sure I know what you mean by "quantitative" spectroscopy. If you mean wavelength determination of specific spectral lines, that can be easily done from the pixel count based on the wavelengths of two known lines. Also, there is an excellent commercial product, RSpec (30 day free trial), which will assist with more precise classification plus do all the math for you. I assembled the following graph to show major features used in the Harvard spectral classification. Anyway, I always had these dreams of doing this sort of thing but only recently have I started getting into modifying the telescope for just simple astrophotography, much less sorting out fitting a spectrometer onto the thing. This is fascinating to me. I love the idea of a spectrograph (I made one of the little DIY ones with a CD to look at lights, the sun (carefully) and other sources), and have wondered what it would take to be able to examine the spectrum of stars. This is very cool, thanks for sharing! You really want to get Tom Field's RSpec program. I did this kind of stuff but with a Star Analyzer. No grism, although some people have added grism to the Star Analyzer. You want to correct the spectrum for atmospheric water absorption, and the non-linear nature of the camera sensor. Once calibrated you can do cool stuff like measure the red shift of 3c 273. Generally you want a grating with fairly low dispersion (small R-value) so that your exposures don't get too long. 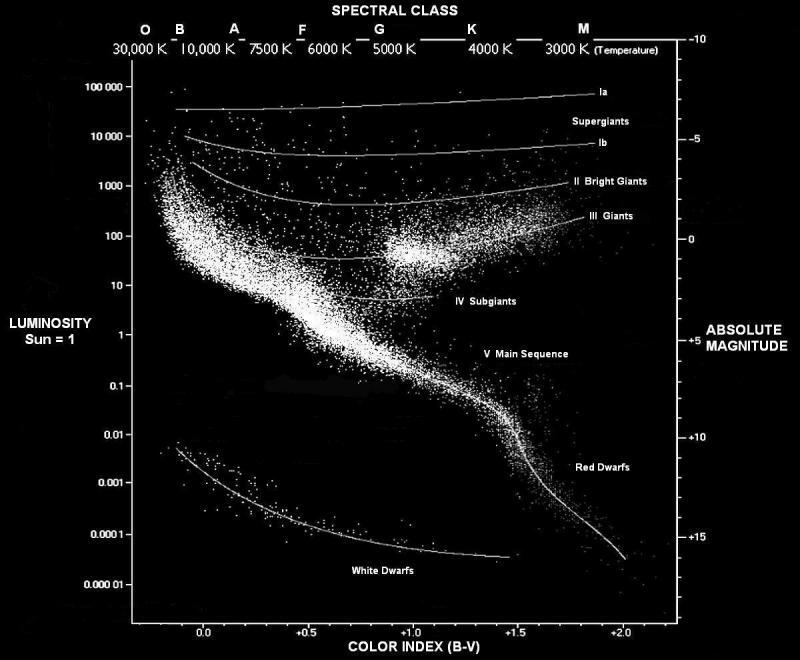 In 1943 astronomers Morgan, Keenan, and Kellman introduced the Yerkes Spectral Classification which was based on the effect stellar surface gravity has on spectral absorption lines. Higher surface gravity produces higher pressure on the surface of a star, which results in measurable broadening of spectral lines. Now, if a small star and a giant star are of similar mass, the small star will be denser, and will have higher surface gravity and pressure because its surface is closer to the star's center of gravity. Therefore, small, dense stars will manifest a higher degree of spectral line broadening. At the same time, the small star has a smaller surface area, and will have less luminosity (or fainter absolute magnitude) than the giant star. After some revisions and refinements this scheme was reintroduced in 1953 as the MK (Morgan-Keenan) Classification, which remains in use to this day. I have not tried yet, but I suspect that performing the MK spectral classification requires professional high resolution spectrographs and dry, steady, high altitude skies. orlyandico, I do have the RSpec program. I used it to analyze Fraunhofer lines in high resolution spectrograms of sunlight and many other light sources, and to correct for the non-linear nature of the camera sensor. Correcting for Earth's atmospheric absorption lines may not be necessary since these lie in the near-IR region, whereas the most common lines used in the Harvard classification lie between the H alpha and H delta lines. I only recently began studying stellar spectroscopy, and already I am looking at bigger telescopes, and talking about retirement, because my job seriously interferes with my hobbies. I wish I had the option of sacrificing my job for my hobbies!!! But sadly, putting food on the table trumps hobbies. Ha ha. Blessed are those who can combine their job with their hobbies. My father was one of those. I am not. Every time I tried to turn a hobby into a job, all I was left with was a job. Here is an outline on calculating physical properties of a star based on its spectral class. Approximate temperature of the solar photosphere, Ts = 5800 K, and of an A8 star T = 8500 K.
The star is approximately 1.5 times larger than the Sun. All values are approximate, but not bad for an amateur.